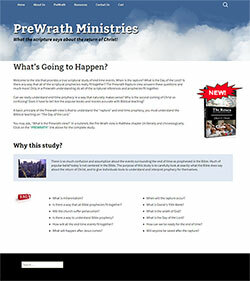 Prewrath Minstries is celebrating a lot of new things! First, we have a brand new responsive, secure, automated website. We have arrived with technology. There are so many things we will be able to do now that we could never do before. In addition, the “In View of the End” PowerPoint® study now comes with a wide-screen format, as well as the standard screen format. And, if you are a former purchaser of the PowerPoint® presentation, you can download the new files at no additional cost. You can login under the Cart -> My Account by using your old login and password. If you need help, feel free to email me.